Welcome to the historic Paso Robles Inn! Below, find the information you need to answer any questions you may have about your upcoming stay at the Paso Robles Inn. If you can't find the information you're looking for, please feel free to contact us and we would be more than happy to help. We look forward to welcoming you to the Paso Robles Inn and all that Paso Robles, CA has to offer. Check-in is guaranteed at 4 PM, however, early check-in can be requested, but not guaranteed. Please call the day of your arrival so we may see if an early check-in is available. Check-out time is 12 PM. A late check-out request is based on availability, and late check-out fees may apply. Contact Guest Services directly to request a late check-out. Is breakfast included with my reservation? Breakfast is not included, however our Steakhouse is open daily from 7-11am serving breakfast. Or book our "Bed & Breakfast Package" to include breakfast with your stay. Does the Paso Robles Inn provide free Wi-Fi? What is your incidental hold policy? Upon check-in, we will place a hold on your card in the amount of room and tax plus $100, in case of any incidental charges (example: Steakhouse charges or Cattlemen's Lounge charges). If a debit card is used, the authorization will appear as an actual charge and the remaining funds will be refunded at check out. The refund can take up to 7 business days to process. Do you still have the hot spring tubs in select rooms? In an effort to please our guests and after careful thought and consideration, the Paso Robles Inn and Martin Resorts has made the decision to cap our access to the Sulfur water at the property. The smell of the sulfur water was often overbearing for our guests and has hindered the overall guest experience. All of our Deluxe Spa rooms will still feature private spa tubs on their patios. For those looking for a sulfur spa tub experience in Paso Robles, please visit River Oaks Hot Springs. 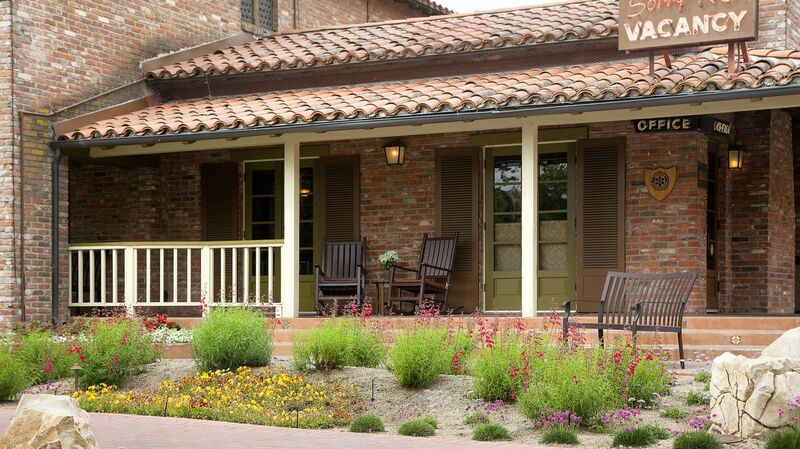 At the Paso Robles Inn, satisfy your hunger without leaving our property! Located just across from the lobby, The Steakhouse at the Paso Robles Inn offers breakfast from 7 AM -11 AM, lunch from 11 AM - 2 PM, and dinner from 5 PM - 9 PM (Tuesday-Saturday). On Sundays, breakfast is served from 7 AM - 2 PM, brunch is served from 10 AM - 2 PM, and dinner is served from 4 PM - 8 PM. Does the Steakhouse allow pets? You can dine with your furry friend while sitting on the Patio at our Steakhouse. Where can I grab a drink? Located upstairs inside the Paso Robles Inn, is the historic Cattlemen's Lounge, which features a full bar, a happy hour Monday through Friday from 4:00 pm - 6:00 pm, and four television screens so you never miss a game. The Paso Robles Inn does not have a fitness center, however, a Day Pass can be purchased from Kennedy Club Fitness. Yes. Breakfast is served from 7 AM - 10:30 AM. Lunch is served from 11 AM - 1:30 PM. The menu can be found in your room. Simply dial 400 to place your order. Does the Paso Robles Inn provide baby cribs? Pack-n-Plays are available for guest use upon request while staying with us. Please request one prior to or during check-in. Rollaway beds are available upon request for the Deluxe Spa Rooms or Jesse James Suites. The Traditional Rooms, unfortunately, cannot accommodate a Rollaway bed. Please request one either prior to or during check-in. Our heated pool and Jacuzzi are open from 8 AM - 10 PM. You can use your room key to access the pool and jacuzzi. For your convenience, pool towels are located at the pool. Can I feed the Koi Fish? Yes, please do! To feed our colorful Koi Fish, simply ask the Front Desk for a cup of fish food, free of charge. What is the Paso Robles Inn's pet policy? The Paso Robles Inn has a minimal number of designated pet rooms. If you are bring a pet, you MUST book one of our pet friendly rooms. Our pet rooms carry a pet fee of $50 per pet, per night, with a $100 maximum additional charge to your room. As a Martin Resorts property, you can earn 500 Alaska Airline miles per qualifying stay at the Paso Robles Inn by booking direct. Must mention you are an Alaska Airlines Mileage Plan member at check-in. Miles will be awarded upon check-out. Plus, travel with Alaska, purchase wines from San Luis Obispo Wine Country, and fly your wine home free! How does the Paso Robles Inn conserve water? We are limiting our water use by placing biodegradable cups in room, replacing towels left on the floor, & changing sheets every 3rd day of your stay (unless requested). Please feel free to contact the Front Desk to request glassware. Conserve water and save $10, ask the Front Desk how. Does the Paso Robles Inn offer wine tours? We do not offer wine tours, but there are a number of touring companies that we can recommend. Or, book our Paso Robles Wine Tour package, which includes overnight accommodations, round-trip transportation, tastings at 4-6 wineries*, and a scenic picnic lunch for two. Is there anything else to do besides wine tasting? There are many things to taste in the downtown area such as Olive tasting and beer tasting - all within walking distance to the hotel. Click here for our complete guide.